When it comes to outdoor swing chairs, the Hanging Chaise Lounge chair from Best Choice Products is a popular option. Everyone loves poolside lounge chairs. And everyone loves porch swings. This model combines the best of these two worlds into one amazing seat designed for comfort and fun. What seems to be the most appreciated quality of this chair is the attention to detail as far as comfort features are concerned. Before we go into details about these, below are a few others of the chair’s key features and practical specifications. Can only accommodate one person at a time. It has a 256 maximum weight capacity. 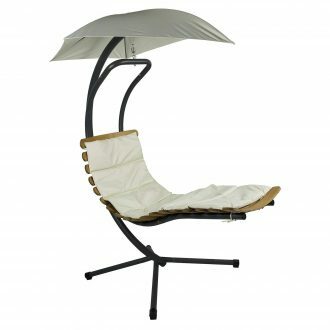 It features a detachable canopy shade to protect the user from harsh weather. It is available in multiple colors including green, blue and orange for aesthetic variety. The cushions are PVC coated for water resistance. The cushions feature a PVC cover stuffed with soft yet firm foam. This padding is a little over 2 inches in thickness. It, therefore, ensures that you can rest comfortably on the seat for long periods of time without getting numb or stiff. The seat also comes with a head rest pillow for additional comfort. However, this might night be comfortable for everyone especially if you are wearing headgear of you have a chunky hairdo. The good news in this case is that the head rest pillow can easily be detached. It is therefore entirely up to you to decide whether or not you want to use it. The seat portion of the swing might be built for one person but it offers plenty of room. You can therefore lay straight, curl up into fa etal position or sit however else you like while on the chair. However, the armrests have been described by users as uncomfortable and restricting. If this is the case for you then you can very easily get rid of them. The smooth curve of the lounge chair allows you to enjoy it both while seated or laying down. The curve is gentle on your back which means you do not have to worry about straining. With all the comfort features, you can very easily spend all your time on this swing without experiencing any discomfort. All you have to do is find that perfect position you will be good to go. The strong and well-constructed frame and stand pretty much guarantee you safety and stability. 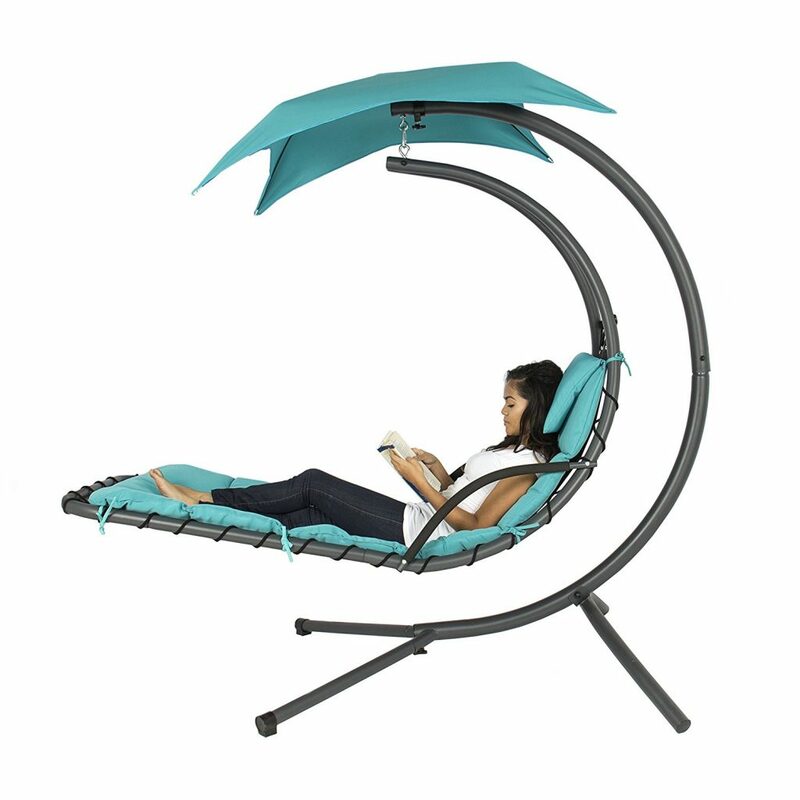 No worrying about the swing toppling over while you rock back and forth in bliss. The PVC coating protects the seat cushions from harsh weather elements including extreme sunlight and rain. This means you can easily set it up outside and leave it there without having to worry about it getting damaged. Like most swings, this set comes in separate pieces for you to assemble on site. The massive nature of the swing makes it particularly difficult with the instructions offering very little help. You will need some extra room in your back yard or porch to set this one up. 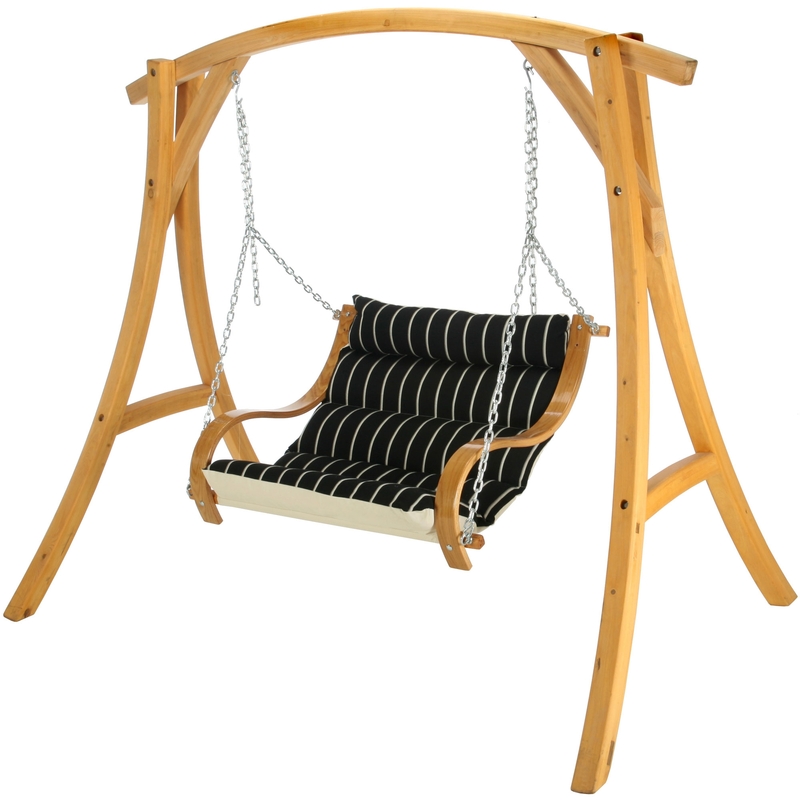 With dimensions of 76 inches height by 46 inches in width, it is actually one of the biggest swings on the market. The PVC might offer the benefit of being waterproof but it also negatively affects overall comfort. Sitting on the swing for long and in hot weather will lead to uncomfortable sweating as a result of the plastic’s heat retention. The fact that it is not aerated also contributes to this outcome. 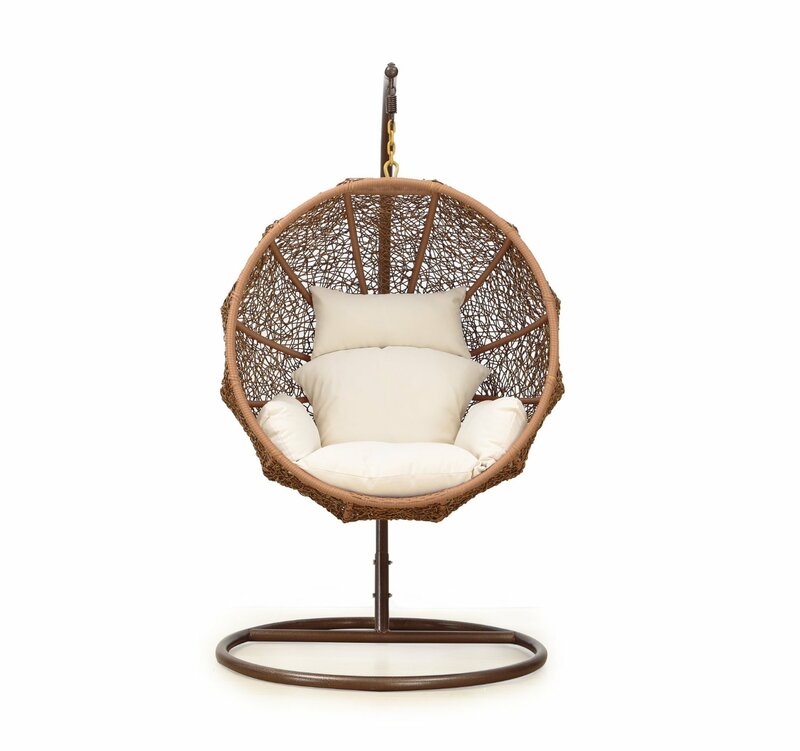 This Island Gale Chair has a woven wicker seat design which contributes to comfort by making it airy. It can accommodate two people with a maximum weight capacity of 538 pounds. The swing seat also features padded cushions on the seat and backrest. However, unlike the Hanging Chaise Lounge Chair these are not waterproof. This means that you need to spend extra time and energy protecting it from rain water and humidity in general. It also occupies a lot of space as with the Chaise Lounge Chair. It is therefore only a great alternative if you want a seat that accommodates more people. It is also worth considering if you have a soft spot for the woven wicker aesthetic. For the most part, this chair has the same design as the Hanging Chaise Lounger from Best Choice Products. 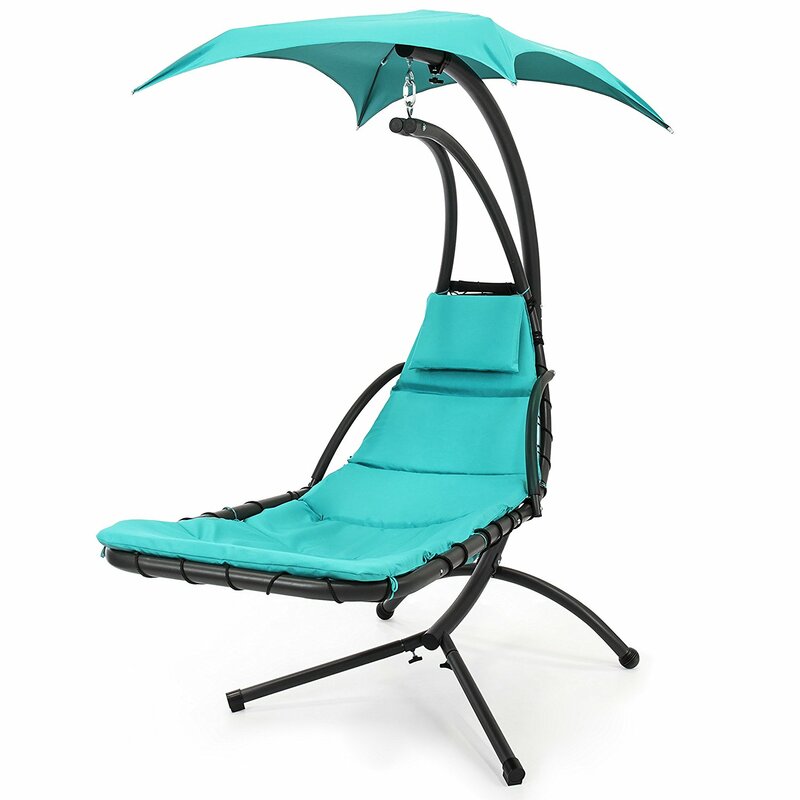 It has the same long smooth curve with the detachable canopy umbrella. However, when it comes to comfort it is greatly lacking. It has thin cushions which make it uncomfortable to rest on for long periods of time. It also has a significantly less stable stand and more likely to topple over. However, if you are looking for something simple and in the same design but more affordable, then it is an option worth considering. 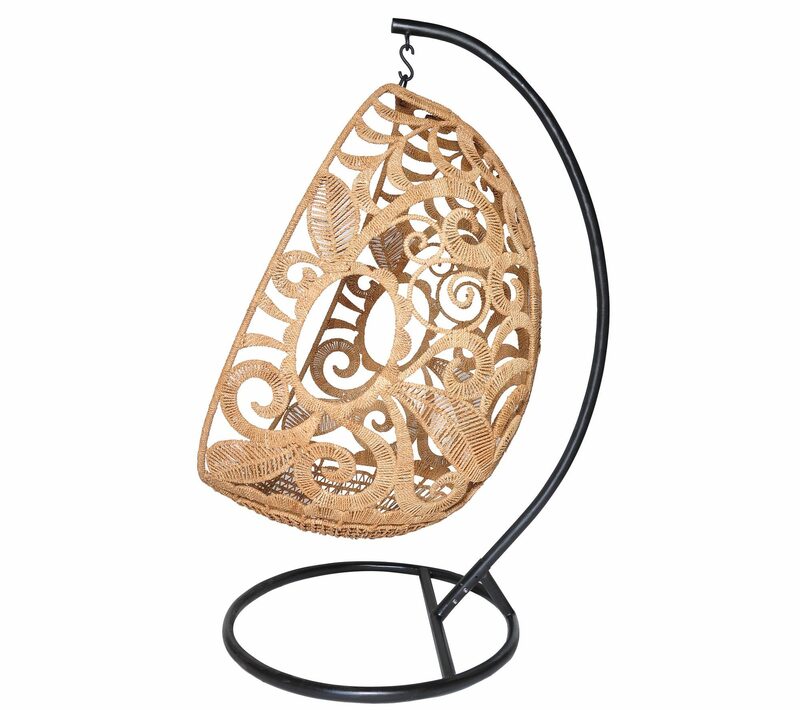 In conclusion, this Hanging Chaise Lounge Chair is a good option for a large and comfortable outdoor swing. The weather proof design, as well as the canopy, make it possible to set it anywhere from your condo rooftop to your suburban home pool deck. The adjustable comfort features also mean you have a lot to look forward to in terms of fun chilling time. So if you are willing to live with the occasional sweat pools and the difficult setup you will have yourself a true treasure.